94 Highett St Richmond. Inner City Melbourne short term holiday vacation rental for up to 14 people. 5 bedrooms, 3 bathrooms and parking for 3 cars. Close to major Melbourne sporting venues such as the MCG, Melbourne Park (tennis centre), AAMI Park and Hisense arena. Inner City Location - walking distance to MCG, Melbourne Park Tennis, AAMI Park, Railway, Trams, Major shopping venues, Restaurants and the City Centre. Location – walking distance to Melbourne Central Business District and major sporting venues (MCG, AAMI Park and Melbourne Park / Rod Laver Arena,). 94 Highett is close to multiple public transport options with West Richmond railway station within 350 metres and 3 tram lines within 400 metres. The area boasts many dining options ranging from cafes, pubs, restaurants and bistros and has two large grocery stores within walking distance. Quality – 94 Highett is equipped with the highest quality fittings such as Air Conditioning, high speed wifi, Internet enabled Smart TV’s, hotel quality linen and towels, hotel quality beds, boutique Vive toiletries, fully equipped kitchen with Miele appliances. Cleanliness – The saying goes ‘you can live in your own mess but not in someone else’s’. We ensure 94 Highett is thoroughly cleaned before your stay. We pride ourselves on constant feedback from our guests as to the cleanliness of the house. 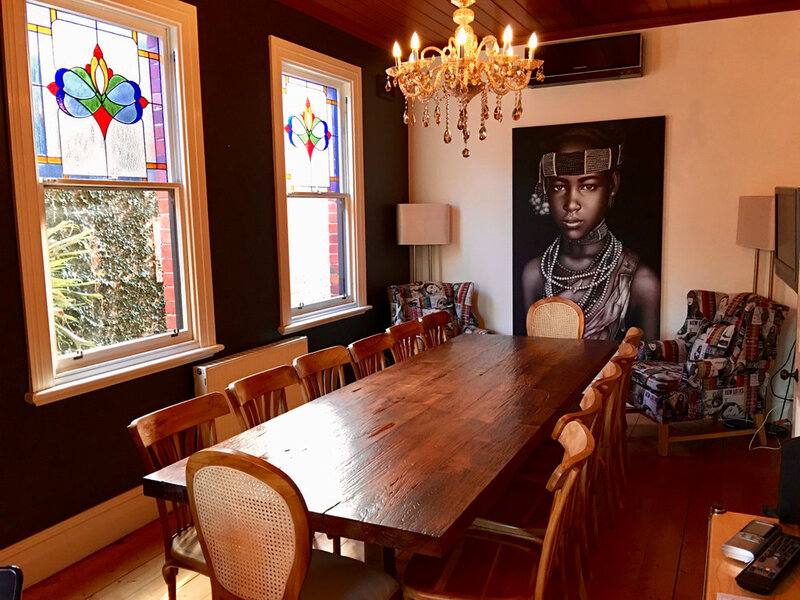 Features – 2 spa tubs, roof top deck with city views.5 bedrooms, 3 bathrooms, free wifi and cable internet, Foxtel, Televisions in every bedroom, outdoor courtyard with BBQ, 14 seater dining table, hydronic heating and parking for 3 cars. Character – A beautiful Victorian Villa built in the 1880’s and loaded with period features such as high ceilings, exquisite crystal chandeliers, lead light windows and open fire places. They don’t build them like this anymore. Richmond is located on the very fringe of Melbourne city centre and contains an eclectic mix of attractions, providing easy access to the best of what Melbourne has to offer. Victoria St Richmond is Melbourne's 'little Siagon'. Lined with Vietnamese and Asian restaurants and shops, it provides some of the best (and most affordable) dining options. Bridge Road is best known for outlet shops and boutiques. The stores are constantly changing and there's always something new to explore....and a new bargain to be had. Church St provides direct 10 min tram ride to Chapel St South Yarra bringing you to the heart of Melbourne's boutique shopping precinct. Richmond provides easy access to the MCG (AFL football, cricket and major sporting events), Melbourne Park (the Australian Open, concerts) and AAMI Park (soccer and rugby). It's a 15-20 minute walk to these major sporting venues from 94 Highett....or a 5 minute tram ride from Bridge Road or Swan St.
94 Highett is very close to trams and trains. West Richmond train station is a 350 metre walk down Highett St. This station is 5 minutes to the city stations including Southern Cross station where the Melbourne Airport bus terminal (skybus) can be found. There are 3 tram lines all within 350 metres of 94 Highett. The Bridge Road and Victoria Street trams both provide easy access to the city within 5-10 minutes. The Church St tram takes you down to the famous Chapel St shopping precinct within 10 minutes. Best of all, the city is only a 25 minute walk away. 2 cars may park off street and 1 permit provided for street parking. A taxi is approx $60 from the airport and the skybus plus a tram at $20.30 per person.